Berries and stone fruit are a wonderful source of anti-oxidants, Vitamin A and C and dietary fibre. Here are a few ideas on ways to use up any fruit that you may have leftover this summer. Most baked goods such as scones, loaves and muffins tend to go stale within a day or so if not eaten. However if you are looking for a way to prolong the life of these foods try replacing some of the milk in the recipe with low fat yoghurt just like we have done. Not only will the yoghurt increase the nutritional value of your baking but, should you have any leftover, the yoghurt will also keep the product moist for an extra day or two. Rub the margarine into the dry ingredients so that the mixture resembles a dried breadcrumb consitency. Stir in the yoghurt and milk and mix the ingredients lightly using a knife to form a ball of dough. Pat the dough flat to a 3cm thickness then cut the dough into 12 evenly sized scones. Place the scones onto a cold oven try and brush lightly with extra milk. 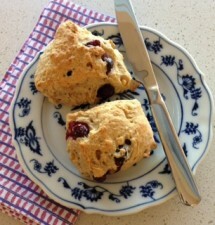 Bake at 200°C for 12-15 minutes until the scones are lightly browned. Each scone contains: Energy 148kcals/620kJ; Protein 2.5g; Fat 7g; Carbohdyrate 19g; Dietary fibre 1g; Sodium 122mg. The blueberries can be replaced with blackcurrants or you might also like to try stoned and finely diced fresh peaches, nectarines, cherries or apricots. In winter you can use finely chopped or grated apple or replaced the fresh fruit with dried apricots, dates, figs or sultanas. The low fat yoghurt can also be of any flavour. Vanilla bean is good but you might also like to try apricot, lemon or mixed berry. Should you have any scones leftover then these freeze well until needed.